Just an hour’s drive from Sheffield, this iconic mountain and the beautiful Dove Lake are easily accessed at the northern end of the Cradle Mountain-Lake St Clair National Park. The renowned Overland Track is a 5-6 day walking link between the mountain and Cynthia Bay on Lake St Clair. While this trek is not for the faint-hearted, there are numerous short, half-day and full-day walks that can be enjoyed in the alpine high country beneath Cradle Mountain. Staying overnight in the Cradle Valley is an experience in itself. There are a number of well-appointed accommodation options for family holiday needs right through to luxury cabins. And when the sun goes down or the snow sets in, there is no shortage of indoor entertainment with pampering day spas, the Devils@Cradle wildlife centre, The Wilderness Gallery, and fine Tasmanian food and wine to enjoy by the fire. Just 25 minutes drive from the National Park is Moina. Once a bustling pioneer town, Moina today is a peaceful retreat, ideal as a base for bushwalkers and fishing enthusiasts heading to the nearby lakes Barrington, Cethana or Gairdner. Walheim Cabins bushwalker accommodation can be booked on www.sheffieldcradleinfo.com.au or call the Kentish Visitor Information Centre 03 6491 1036. 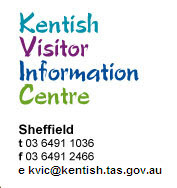 Email kvic@kentish.tas.gov.au . The months of December - April have long daylight hours and warmer average temperatures. These months are recommended to walkers inexperienced in Tasmanian conditions.However, walkers are warned that rapidly changing weather conditions can occur at any time of the year. These can include howling winds, sleet, snow, relentless rain and blazing sun. All of these varied conditions can be experienced within a single day.